Published on September 5, 2014 by Lawrence Hamilton Follow me on Twitter here. Perhaps no other country offers so much entertainment on the side of the road as the USA. Roadside attractions offer weary travelers a rest from the road and something amusing to enjoy. The best offer a slice of local culture and give you something to mentally chew over. On a recent trip with my wife and nephew we came across a curious roadside attraction dedicated to a forgotten Kentucky son. Jefferson Davis, the man who served as president of the Confederacy during America’s Civil War, was a moderately prosperous farmer growing up in the South. After graduating from West Point military academy (even after being accused of smuggling whiskey into the academy to make eggnog), he went on to serve in the Mexican-American war. During his time in the war he was commended for his bravery, while also suffering grievous and extremely painful injuries. For his valor he was appointed to the Senate in the state of Mississippi. His life seemed to turn between strokes of luck and despair. His first wife died tragically, and three of six children from his second marriage died, while he battled with malaria. Yet his political career seemed to be divinely ordained, and his stature in the military and government continued to grow. During his time in politics he was a senator and secretary of war for president Franklin Pierce. During his time in politics, he was pro-slavery but also anti-secessionist. When the time came, he accepted the the presidency of the Confederacy. So why the monument in Kentucky? It turns out he was born here. Davis’s memorial was an impressive phallic monument. It was hard not be awed at the sheer size of the structure, jutting out from the western Kentucky hills like an indignant hangnail. We walked around the base of the memorial, snapping a few first impressions. We were approached by a tour guide who asked if we wanted to go to the top of the monument. She was already taking up an older woman with two small children who I took to be her grand kids. Her shirt advertised Noah’s Ark, The Musical, from Branson, Missouri. They waited at the base of the monument while we went and exchanged some green notes for red cardboard tickets that said ADMIT ONE. I made a mental note that one the girls working behind the counter was African-American. A strange sight in a room awash with Confederate paraphernalia. On our way to meet the other members of our tour group, we hurried past a plaque showing the history of Jefferson Davis without getting a chance to read it. Our tour guide, a rather heavyset woman with a brown ponytail and thick glasses, displayed a nerdy reverence for the ex-president of the Confederacy. As the elevator doors closed behind us, she clicked the number 2, taking us the one stop to the top. On the way up we learned that the Davis memorial was modeled after the Washington Monument in Washington D.C. because both Washington and Davis could lay claim to being the first presidents of independent countries on the continent (i.e. the Union and the Confederacy). Standing at 351 feet, The Jefferson Davis memorial is two thirds smaller than the Washington Monument. The elevator ride came to a halt and we exited into a small square room with very small barred windows. The lack of upkeep was hard not to find uninspiring. I had expected to find the memorial adorned with images of Davis’s greatness and interesting historical facts. Instead, an open trash can and a broken window frame propped up against the wall were the only objects in the room. We shuffled dutifully from window to window looking out at the fields below. I chuckled as I noticed a few mobile home trailers with an above ground swimming pool. The memorial was a view from above at the stereotypical South that Davis helped solidify into lore. I asked our guide what she thought of Davis’s legacy. I asked what mistakes they made. She rattled off strategic mishaps of Davis and his reluctance to delegate authority and allow commanding officers on the ground to make critical decisions. As for Lincoln, his emancipation proclamation announcement was politically miscalculated. In reality, it did nothing to help blacks across the whole country. I noticed Davis’s support of slavery was strangely omitted from his list of miscalculations. The others on our tour seemed to bristle at the discussion of history, they wanted to enjoy the view. On the lonely highway below I noticed the horse and buggy of the Amish plowing alongside the road, commenting on it as a way of changing the topic. After some minutes, we got on the elevator and our guide regaled us with one last story about how a shadowy political interest group called the Massachusetts Men pleaded with Davis to get him to run for the presidency in 1860. He declined although a lot of people thought that if he had run against Lincoln in that fateful year he would have surely won. Back on earth we walked out of the memorial to a large group of young Amish women gathering around for photographs. We walked around to a small cemetery near the visitor’s center. From the highway we stopped for one more photograph. 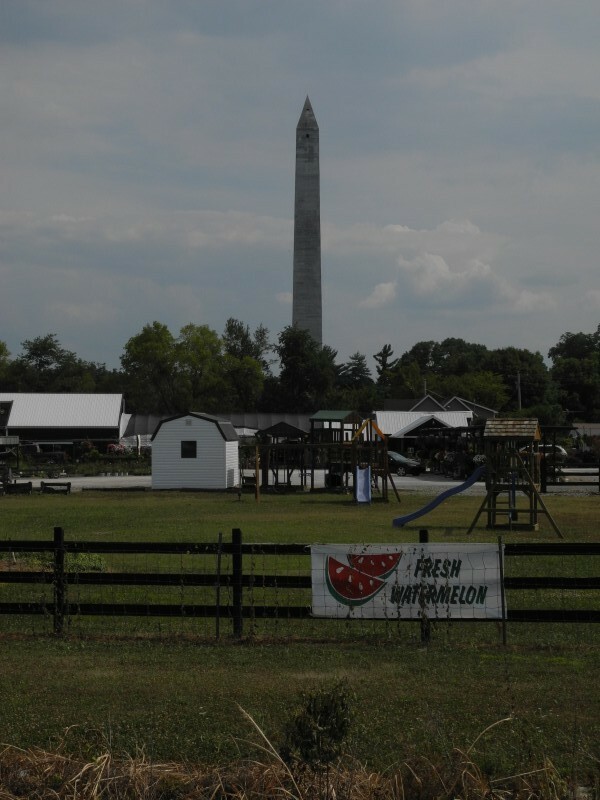 In front of the memorial was a giant sign that said ‘FRESH WATERMELON’ in front children’s playground equipment. Next post: The Worst Airport Terminal in America?